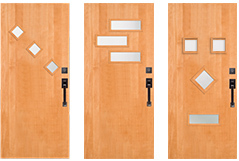 Personalize Your Contemporary Flush Door | Simpson Door Co.
Simpson can make your contemporary door in virtually any design, wood species and with any glass type. So you can personalize a door to your specific style and taste. Select and drag a glass type(s) from the styles to the left. You can resize the glass by dragging the white handle in the lower right hand corner of the glass. Position the glass anywhere on the door. Mix & match and choose as many different shapes (or the same) as you wish. The possibilities are endless, because like all Simpson doors, we can engineer whatever you can dream up.